Ministry of Propaganda - 16/Jul/2006: "Summer Afternoon on the Isle of Purbeck"
Having left from Swindon around mid morning I arrived on the Isle of Purbeck early in the afternoon after a not too bad journey, some traffic, but no real major congestion despite the fantastic weather. My first stop was Corfe Castle and the Greyhound Inn. Their menu looked tempting, but because of the heat I wasn't that hungry and settled for a pint of Ringwood Ale and a bag of crisps. 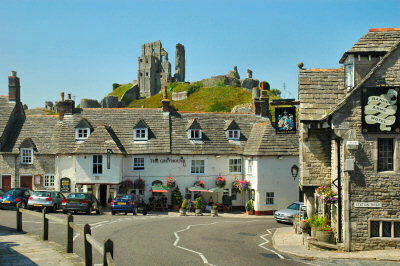 Their beer garden overlooks the ruins Corfe Castle, which I visited next. 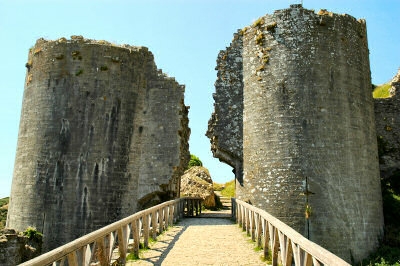 During my previous visit to Corfe Castle I had only looked at the castle from the outside and walked around the village. This time (and as I've since joined the National Trust) I also went into the castle. Unfortunately they recently had to close parts of the castle for safety reasons (they hope to reopen them at some point), but there was still enough to see. The castle was never defeated despite the sorry state it is in now: It fell to treachery from within during the Civil War and was largely destroyed by Parliamentarian engineers. They dug holes under the walls and towers and set off charges of gunpowder, this is well illustrated at the gatehouse, where the left part is about three metres lower than the left (look at the arch of the gate to see the difference). The rest of the afternoon and early evening I spent at Durlston Country Park. 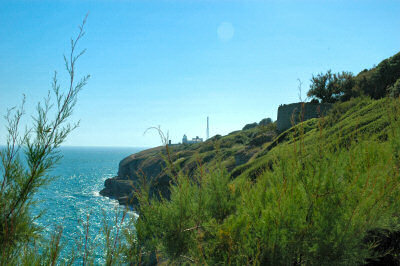 I walked along the coastal path a little bit, enjoying the great views, then sat down for a picknick. I finished reading Watching the English, more about that in another entry. Early in the evening when I was just getting ready to leave I noticed two young men with towels and swimming trunks coming down the hill. As there isn't a beach to go swimming I was curious what they were up to. Turned out at least one of them was jumping off the cliffs into the sea, possibly quite dangerous although they looked like they knew what they were doing.